Nikon’s refresh of its top-flight professional camera follows a predictable cycle, and two years on from the announcement of the D4, the revamped model is now finally with us in the form of the Nikon D4s. Like earlier refreshes, externally the new model looks much the same as its predecessor but although there have been some slight modifications to the rear of the camera most of the changes take place inside the alloy shell. Although the sensor is the same 16.2-Mpix type CMOS device as the D4s perhaps the most significant change is the upgrading of the imaging-processing engine from Expeed 3 to Expeed 4. Not only does this expand the camera’s capabilities with regard to ISO range (now including a new maximum ISO 409,600 extended setting) but it also allows for slightly faster continuous-shooting (now 11fps, up from 10fps) for up to 200 frames (JPEG fine L) and a new 1080 50/60p video capture option. The improvements in the processor also mean the D4s can muster more from its battery pack, the modified EN-EL18a. 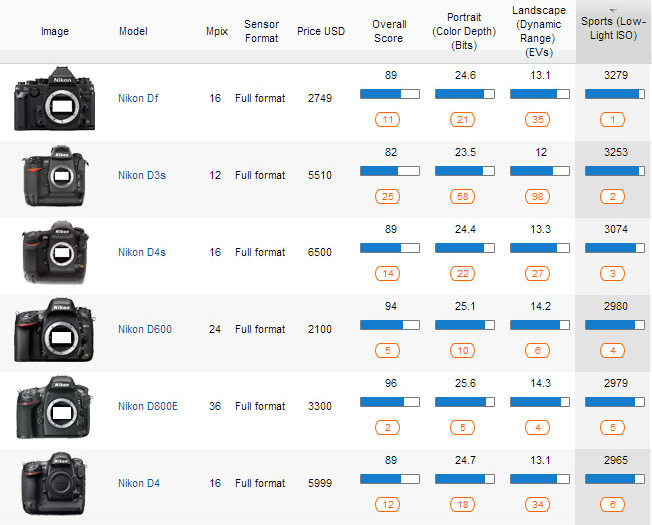 Nikon claim 3,020 shots per charge as opposed to 2,600 from the EN-EL18 in the D4. In addition to the previously mentioned video frame rates, the D4s adds ISO Auto control to video capture in manual exposure (with exposure compensation), and simultaneous recording to an external recorder as well as the memory card. Live view output can also viewed while recording uncompressed video via HDMI. Sound recording now features the option to select the frequency range and level. Nikon has also reduced the viewfinder blackout time, improved AF ‘lock-on and enhanced the 51-point AF system with a new group area AF option that monitors 5 groups of sensors offering more control over the size of AF area. The camera is available for pre-order at $6,499. 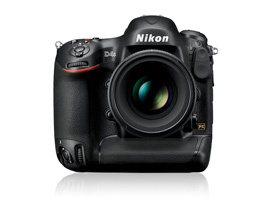 Nikon D4s versus Nikon D4: What’s new? 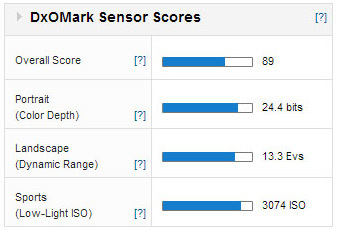 With a DxOMark a score of 89 points the revamped Nikon D4s achieves a very high sensor and comes in 12th place overall in our sensor rankings. That’s on a par with its predecessor and the full-frame Nikon Df and Nikon D3s (now discontinued), but still some way behind the Nikon D600/610 and D800 models. Color sensitivity, or color depth as its measured is high at 24.4 bits and is only just behind the best in class for this sensor size. Dynamic range is also very good at 13.3 Evs although it’s a little lower than most of firm’s current range of DSLRs (including APS-C models). However, this camera is all about shooting under available light and, while, as you might expect the low light score is excellent it’s still not quite the leader in this category (although it’s very close). 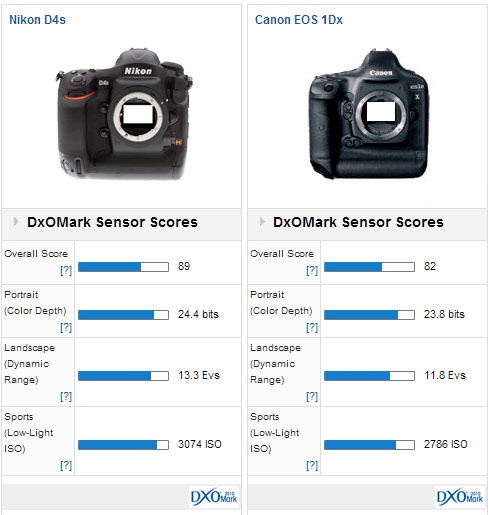 Low light capabilities are exceptional, but the Nikon D4s ranks third in this category after the Nikon Df, and the older, now discontinued Nikon D3s. The most obvious rival of course is the Canon EOS 1D X, the firm’s first high-speed full-frame model aimed at photojournalists and a formidable camera with a hugely impressive capability. Before we compare the hard data between the two sensors, lets quickly recap on the flagship Canon’s specification. The camera replaced both the photojournalist-oriented APS-H size Canon EOS 1D Mk IV and the full-frame 21-Mpix Canon EOS 1Ds Mk III and offered both an improved high-speed and low-light capability and a completely redesigned AF system. Like the D4 and D4s, the EOS 1D X has a full-frame CMOS sensor but it’s a slightly higher pixel count 18-Mpix device and adopts some serious processing power. This enables the Canon EOS 1D X to shoot continuously at up to 14fps (12 fps with continuous AF) and offer a maximum sensitivity of ISO 51,200 (204,800, extended). In addition the Canon EOS 1D X was the first to feature the firm’s new 61-point AF system with 21 cross type AF sensors, sensitive to lenses with f5.6 apertures (and faster) and a 100,000 pixel RGB metering system, a variant of which was to be used in the Canon EOS 5D Mk III. At the time of its launch in late 2011, the EOS 1D X was one of the most fully featured HD-DSLRs and it remains so today. As well as offering 1080p at 30/25 and 24fps it has two compression formats – a low compression ‘ALL-I’ option for the highest quality and a more storage-friendly IPB format. The Canon EOS 1D X can shoot at 60fps rate but at 720p not the 1080p of the D4s. 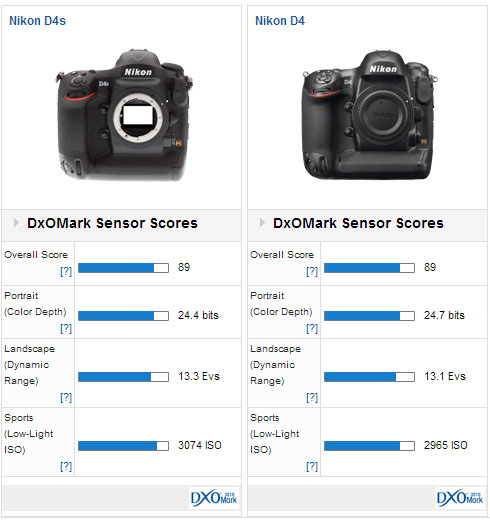 In our tests the proprietary 18-Mpix sensor in the Canon is overshadowed slightly by the Nikon D4s in every one of our use cases accounting for the 7-point lead in the DxOMark sensor score. Individually, the Nikon D4s has slightly better color discrimination of roughly +1/3 stop over the Canon and there’s a slight lead in low light performance but the main advantage is a close to +2 stops improvement in dynamic range at base ISO. Although Nikon has improved a number a features, and added several video-oriented functions most of these have been achievable by upgrading the processor. Although some slight gains have been made minimizing shadow noise and expanding the dynamic range, sensor performance is largely unchanged. That’s not to say the D4s isn’t compelling in anyway, as it is, but anyone that expected significant gains in performance are going to have to wait for the Nikon D5.